Our final week! In the end, my group and I were all quite happy with our final design and implementation. The website worked flawlessly except for one part that I couldn't figure out how to get the score to automatically be added to the database instead of manually entering it. Though this did not phase our tutor, who spoke very highly to us about the rest of the game but particularly the design. She loved it. So I think the trade show went fantastically. 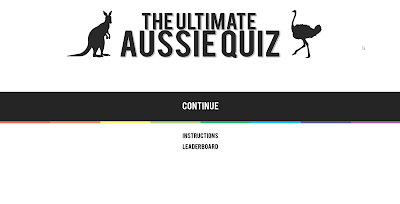 The tutor was not the only person who enjoyed our site, I observed as other students in the class went and had a go at our 'Aussie Quiz' and had a few laughs, they seemed to be enjoying themselves and particularly liked having their name on the top 10 leader board! After the trade show finished we had a few little bugs (trove images loading in wrong order) to fix before the final submission, which also included finalizing the report. Apart from that, we were done and dusted with DECO1800. Not really, still had to finish blogs and portfolios. This was just another normal week where we were working toward our final goal of a fully functional website. We decided to make a to-do list in order to better organise ourselves and check off tasks that needed to be completed, as we did them. This proved quite helpful as we knew who was working on what and it saved a lot of time during communication as we already knew what each person was working on. We are also looking forward to next week when we have our final presentation and trade show, where everyone will be able to see the result of our hard work and dedication to this project. At this point in the project I have been more than happy with my group members and the progress we have made as a team toward our final goal. I do believe that my team agrees with that statement, they feel the same way about the project as I do. This week we presented our digital prototype to the class. There are still a number of things to do. My leader board does not display the top 10 scores and it also needs to be linked with the score from the actual game, which is still being worked on. 1 point needs to be added to the score tally when the correct answer only is chosen, right now its adding a point for every answer. Also, trove images need to be implemented still on the questions page. Overall I felt really please with our prototype because we received a number of positive and encouraging comments from our peers and tutors alike. I felt like we were on the right track to a great quiz game and it was nearly within our reach, only two more weeks until our final presentation at the trade show. From now our plan is to polish up the core features of the website and then potentially focus on adding more features like the suggested difficulty level of questions. In this particular week I came to class and found that the tutor had decided to play music from the speakers in the class room. The mood was a lot more laid back and as a team we didn't really have much constructive work being done. Mostly conversation about what we did over the mid semester break. But we did get eachother up to date with what work we had completed in the time we had been apart. Over the break we managed to finalise most of our website design and all the pages were functioning correctly, no broken links or anything were found upon inspection. I felt really pleased with my groups progress, as we seemed to be on track and had more of a vision for our final product compared with what I had seen with some other groups. But I didn't let this distract us, I made sure each team member continued working on their assigned parts so we didn't get behind as the project deadline was looming ever so close over our heads. It would have been a big problem if we left everything so late that it clashed with exam study and other due work in the coming weeks, so better to get most of it out of the way now. In the contact we worked out some bugs interfering with our UI and that was about it. Some of my team members worked on our progress report this week and I believe they finished it in a day, it was very good. All my group members promised to try hard over the break to catch up on some parts that we were lagging behind in, in order to be more organised and making our life with this project easier. Lets see what happens when I come back in a few weeks. This week I used my workup session to quiz my tutor a bit more about phpmyadmin. 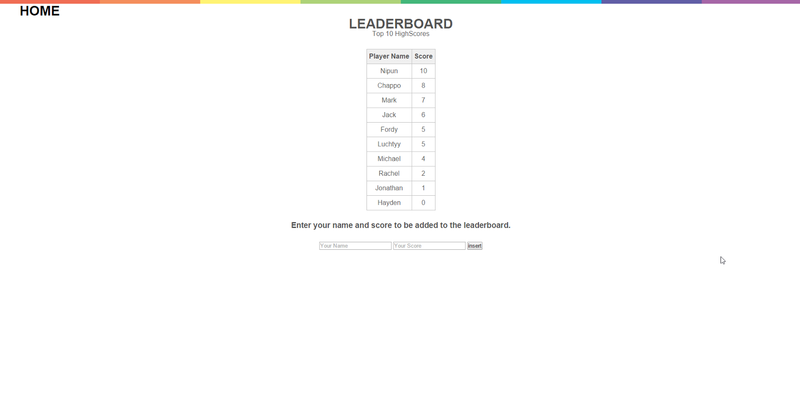 This is the section of our quiz game that i will be working on, the database for the leaderboard. 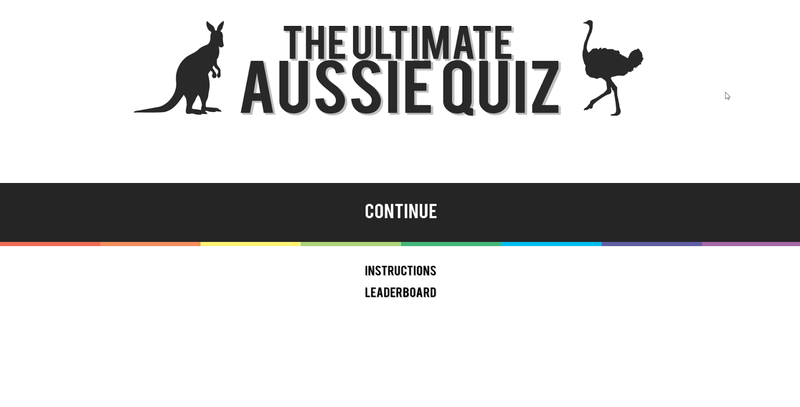 I have created the database itself and have all the different categories set up for it, such as the name of a user, score of the user, and time date the quiz was taken. 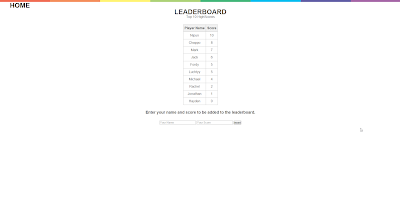 I am yet to figure out how i will link the leaderboard with the quiz itself, i will surely have to discuss with the rest of my team later this week how we are going to do that. I think it would probably be better to work that out though once the core game has been completed. In the contact session we had to sit through all the other groups progress reports, showcasing their quiz and its features. We also had to do a short presentation to the tutor only as we had run out of time and the tutors split up to cover more groups at the same time. This week in the contact session we had to give peer to peer feedback to other groups and also receive some feedback too! 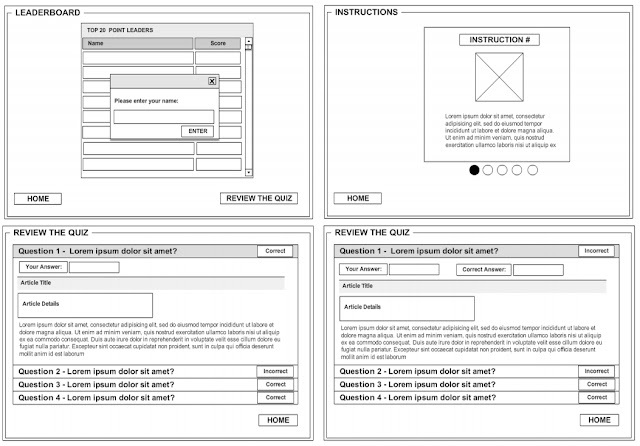 With the use of paper prototypes, created by David Fell for our website, I explained to other people in the class and showed them how our quiz game would be working. They were then given an online google form to fill out and provide us with feedback. The feedback we received was mostly positive, as the only complaints we go were saying the game itself was 'too simple' and this indicated to us that we should possibly add some more challenging elements to the game. After showing a tutor our paper prototypes, they especially liked our design and colour scheme elements of the website. He then told us that he thought our Trove element was shoehorned in, and thought we should make it more of a defining element of our quiz. This gave us some food for thought and we then discussed as a group about how we should be making trove more of a BIG thing in our quiz.